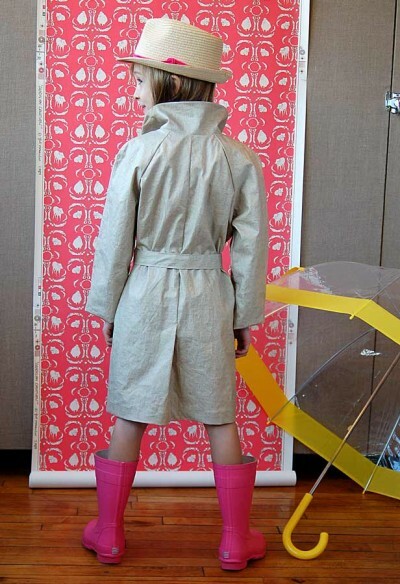 I can’t recall how or why I decided we needed to make a trench coat pattern. It’s probably not the first clothing item you consider when you’re thinking about your child’s wardrobe. But once we started to develop this style, I started seeing kids in trench coats all over the place. 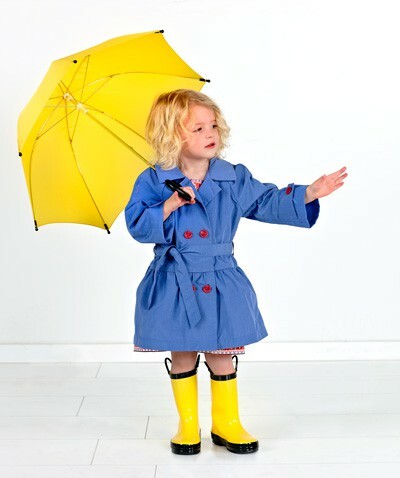 And kids in trench coats are soooo cute! Don’t believe me? I’ll show you. Last week The New York Times Style Section declared, “We can say it confidently: a trench coat, reimagined with playful new tweaks, is the season’s must-have wardrobe essential.” And who am I to argue with The New York Times? What better opportunity to reimagine a classic pattern with playful new tweaks than to sew it yourself! You’ll have opportunity to include all sorts of fun things when you sew this pattern. In coming weeks, I’ll show you more examples and ideas in future posts and on Pinterest. It’s a great jacket for all sorts of weather and activities, including keeping an eye on things. So what can I tell you about this style? First of all, do NOT be intimidated. You’ll be so surprised at how quickly and easily this style comes together. It’s unlined. It has raglan sleeves (easy to sew!). The collar is the easiest collar known to human-kind. We designed it that way. Really. You can trust me on this. Even better? You can make the classic trench coat style, which is great for both boys and girls, or you can take the feminine route and make the dropped-waist version with a little skirt. Both equally darling. Both simple and fun. Of course we had to put in some great details for you. The shoulder flap is one of those details. (Here’s an interesting fact. The shoulder flap on a trench coat is traditionally referred to as a “gun flap” because of the trench coat’s military origins. The trench coat was designed to be worn in the trenches by soldiers during the First World War. But we’re not calling our flap a “gun flap,” OK?) Others include the little sleeve tabs, the pockets, and the back vent on the unisex version. These are all fun details that make the trench coat look extra cool but aren’t challenging to sew at all. Since the coat is un-lined, it’s fun to finish the seam allowances so the inside looks as nice as the outside. To that end, we’ve included detailed instructions for finishing the seam allowances with bias binding. 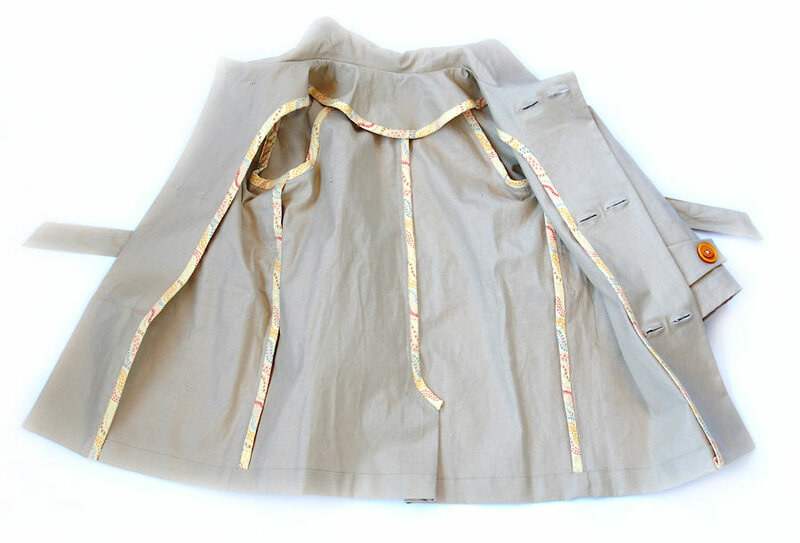 You don’t HAVE to finish them this way (the bias binding is a separate section in the instructions that you can completely ignore if you prefer) but if you do finish them this way you’ll have a trench coat that looks pretty amazing on the inside. We kept this pattern simple so it’s easy for everyone to sew, but if you want to get fancy with it you could easily add lots of topstitching, maybe put a buckle on the belt, and put buttons on the shoulder flap and the pockets to make it into something amazing. It’s a great pattern to customize. In terms of fabrics, of course you can use traditional twill for your trench coat. You could also use canvas, denim, or laminates. Or corduroy. Anything that’s substantial enough to make a decent jacket will be great for this pattern. And remember how I said that it’s not hard to sew? We’ve rated it two scissors. You can totally do this. I’ll practically be there holding your hand while you make it. Unless you stay up until 2 AM. Then you’re on your own. Looooove this trench coat!! Sooo cute!! This is EXACTLY what I’ve been imagining in my daughter’s wardrobe for 2 seasons now! I’m crazy excited about this!! Love this so much! Cannot wait to try out this pattern! Is it possible for you to share exactly which fabric you used (designer/collection, etc.) 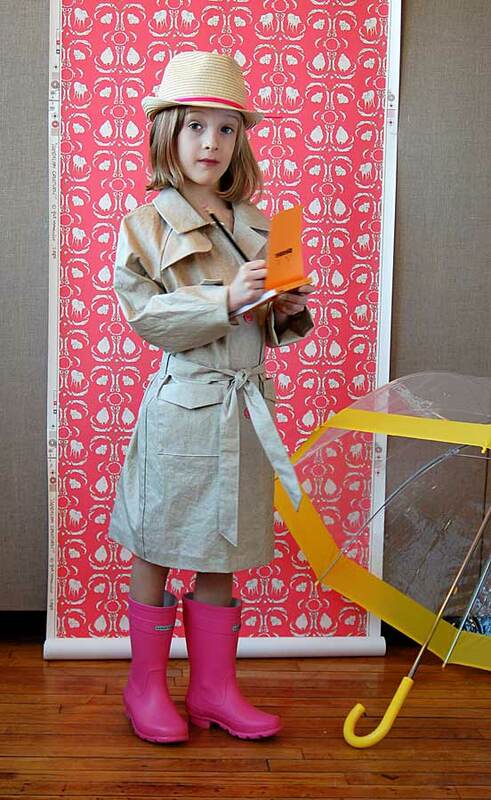 to make the tan version of the trench that your daughter is wearing? Thank you!! Emily, I will absolutely be sharing that information with you very shortly. I’m working with the store where I purchased it to see if we can’t make it available for you to purchase as well. Stay tuned for details! I love it! Do you think it would be possible to add a hood? Maybe in place of the flap? That would make it perfect. This is such a perfect London pattern. I can’t wait to have it in the shop! I will definitely make this first and I am happy to blog it on my baby blog. Ooh, can we put the seams (some of them?) on the outside, like the one you saw on the stylish man in the street? 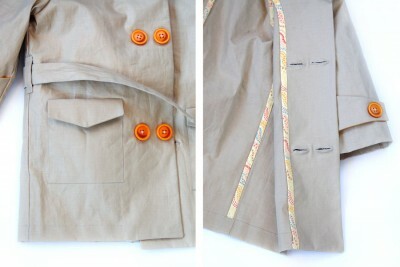 Tan twill with neon bias tape! So I live in So Cal, and we just had probably our last rain of the season this past weekend, and I’m sure the weather will be warm in a couple of weeks…..yet, I’m absolutely going to make this as soon as I can get the pattern in my hands! Maybe I’ll buy the larger size to grow into….I’m so excited for this pattern! Having gotten a lucky chance to test it, this really was a smooth and classy pattern! It looked so professional when done and so well finished on the inside. Hands down the easiest coat I’ve ever sewn (no zipper, no lining, all straight seams) and looks even better than one from the store (of course!) Great work Liesl and team! S looks so chic- love the back view. And the girly version with the skirt looks super cute! Aaah! This has got to be the next one I sew. Can’t wait can’t wait can’t wai! Oh wow! that is delicious! and great to know it’s so easy. Thank you so much! Can’t wait! My son was just saying that he wants a trench coat mostly because he wants to dress like Tintin. And I shuddered at the thought and the expense of finding one in size 8…Now I have a sewing challenge waiting for me. OOOOOhhh love this. WIll have to make a bright pink one one for my daughter and small blue one for our son – and then take a gazillion pictures. LOVE IT. VERY Harriet the Spy!!! My favorite story! This looks like a great pattern. Can I ask where you got the pattern?? I’m looking for one for my son and they’re hard to find. Stephanie, the pattern is available here: http://oliverands.com/product/OLV-OS032ST.html. 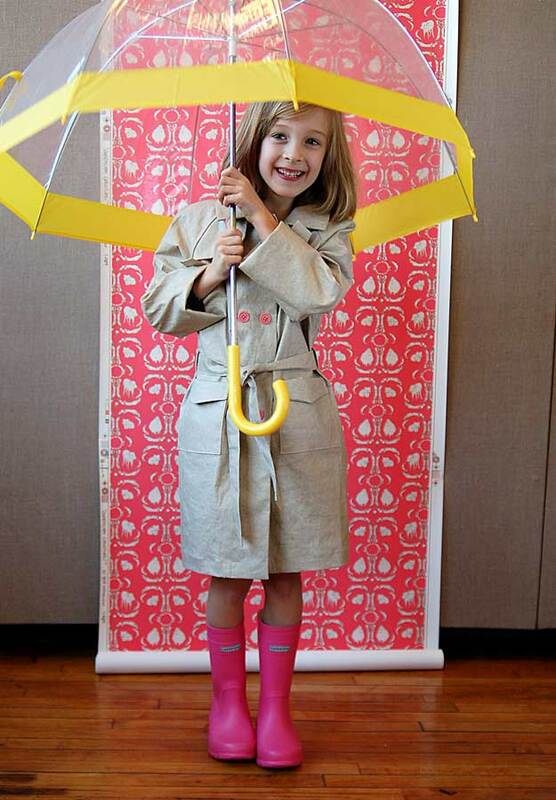 i am trying to find a trench coat like this however I need it to go to the floor. I need it for a boys size 5/6. I’m really confused. Can you help me? How do i get to the instructions?